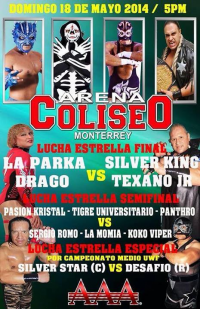 3) La Parka & Toscano vs Argos & Máscara Año 2000 Jr.
Drago beat Cuervo with the Yamoto-Toshi. Ozz pulled Crazy's mask and beat him. Moved all the way up to the tercera. Suicide won with his tornillo shooting star press. 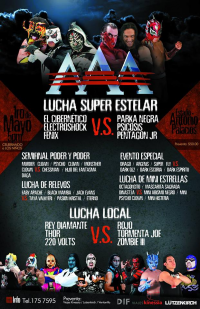 As by rule, Pentagon Jr. immediately destroyed the victorious tecnico and left him bloodied. Made a title match after the last taping. 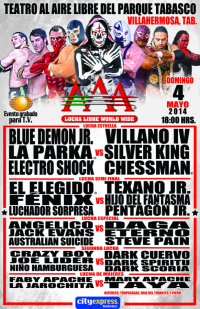 Angelico & Jack retained, their second defense. Jack pinned Pain after the 630 senton. 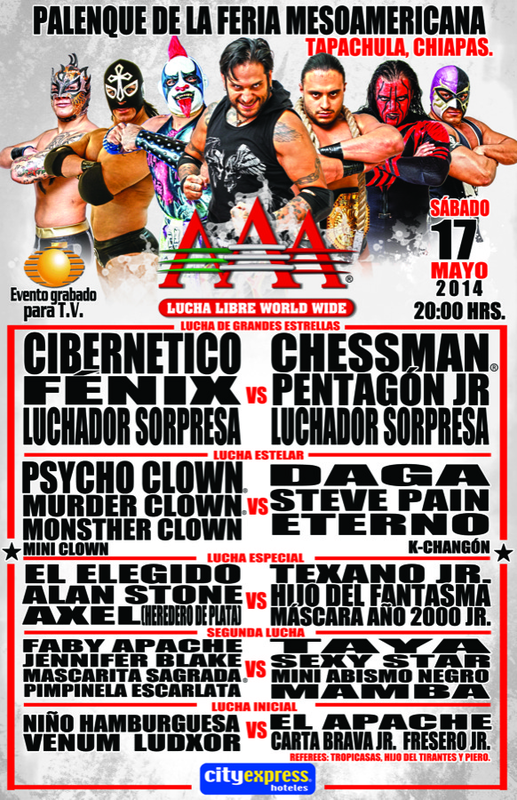 Psycho Clown beat Texano Jr. with the Canadian Destoryer for the fourth straight time, according to the recap. 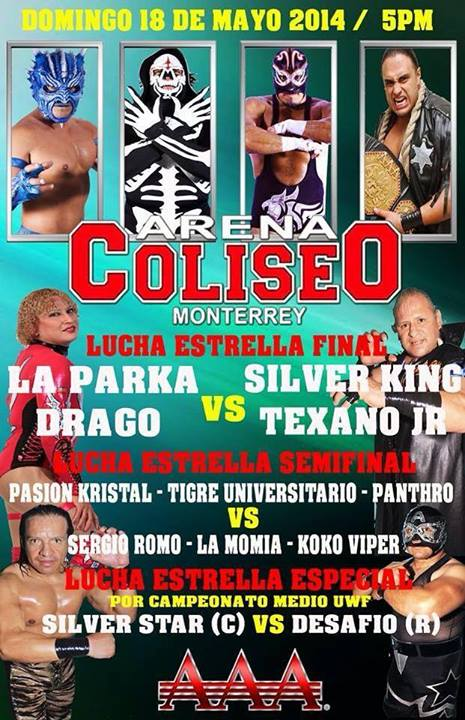 A title match was set for 06/07 in Orizaba, the site of Verano de Escandalo. 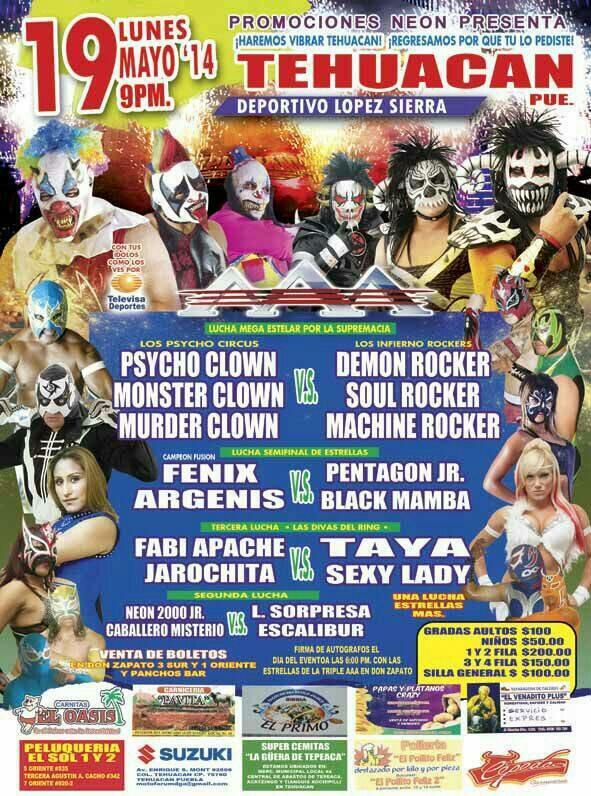 Bengala, not the current luchador in CMLL, debuted here and beat Psicsosis with a piledriver. Dark match, names may have changed. Mamba & Kristal were added to the match. Taya beat Kristal via northern lights suplex. Daga submitted Suicide after a Pentagon distraction. Bengala was the mystery wrestler and beat Pentagon after a Suicide distraction. 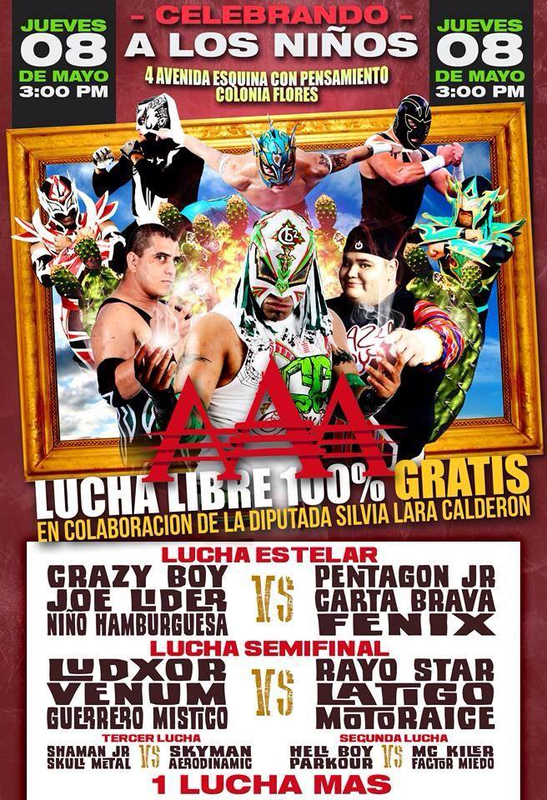 5) Crazy Boy, Joe Lider, Niño Hamburguesa vs Carta Brava Jr., Fénix, Pentagón Jr. Event Notes: may be wrong city. 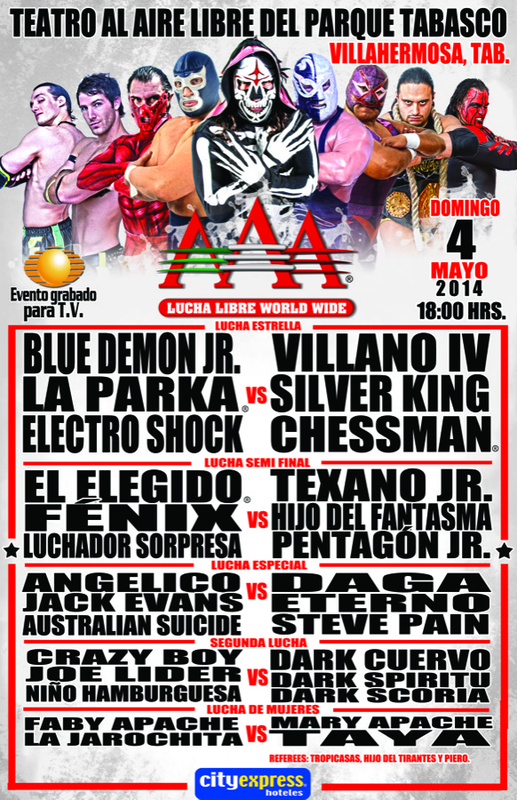 4) Drago, El Elegido, La Parka vs Daga, Psicosis, Texano Jr.
Arturo Rivera made his AAA return before the match. Hamburguesa splash on Apache. 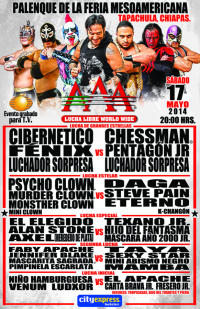 Texano attacked Psycho Clown and Daga beat a distracted Monsther Clown. Moved to the semimain. Fantasma beat Elegido. 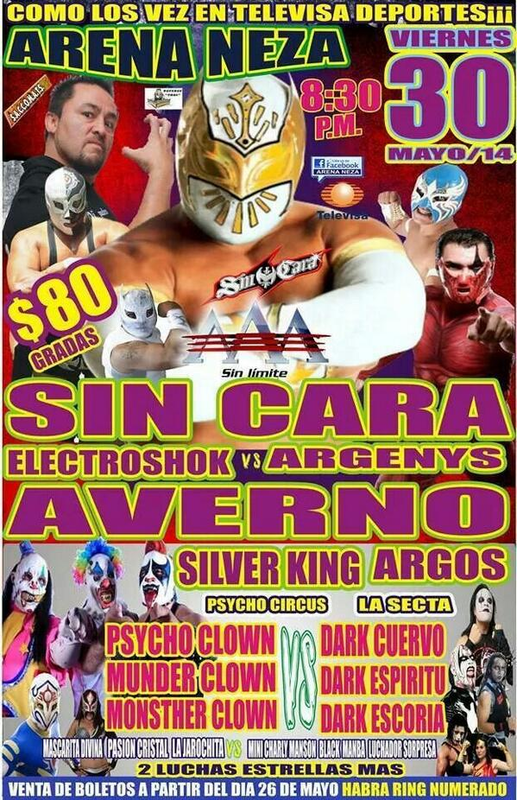 Averno was the surprise rudo - using that name. 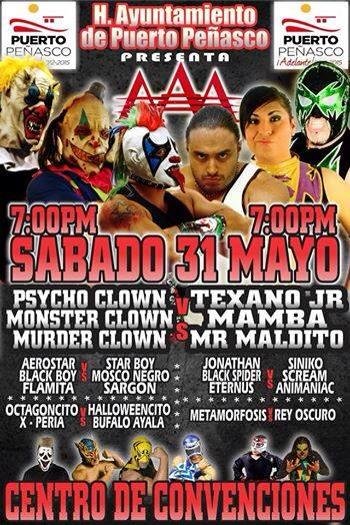 Psycho Clown was the tecnico surprise. Averno beat Fenix clean. Ameno played and the mystery man from February reappeared, now in all white, and made the save for the AAA side after a La Sociedad attack. 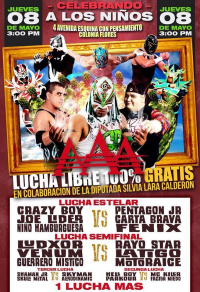 He's obviously Sin Cara, but wasn't given a name here. 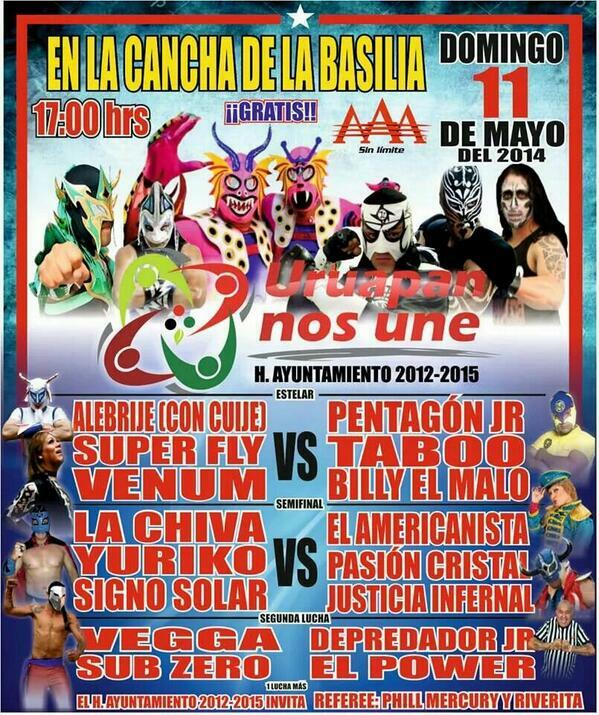 1) Cruz Infernal, Harry El Sucio, Mercenario b Lethal, Love Star, Tigre Veracruzano Jr. 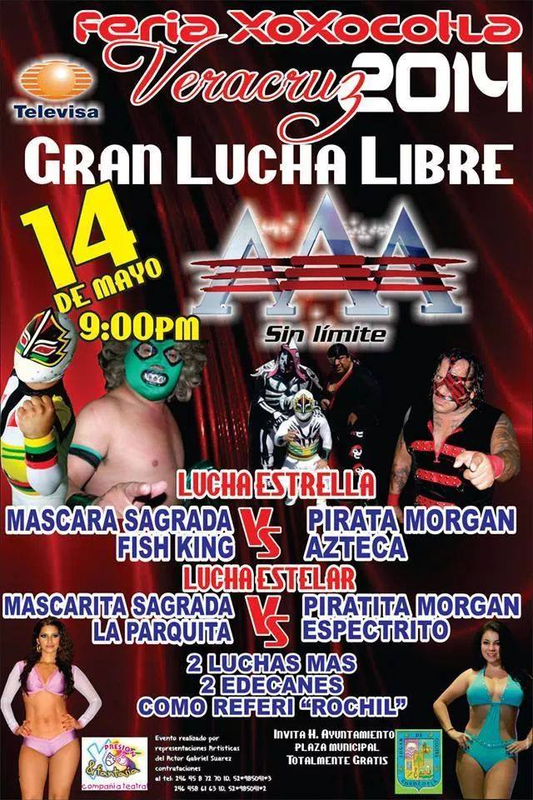 Originally scheduled as a UWF middle defense by Silver Star against Silver Star, but Silver Star didn't appear. 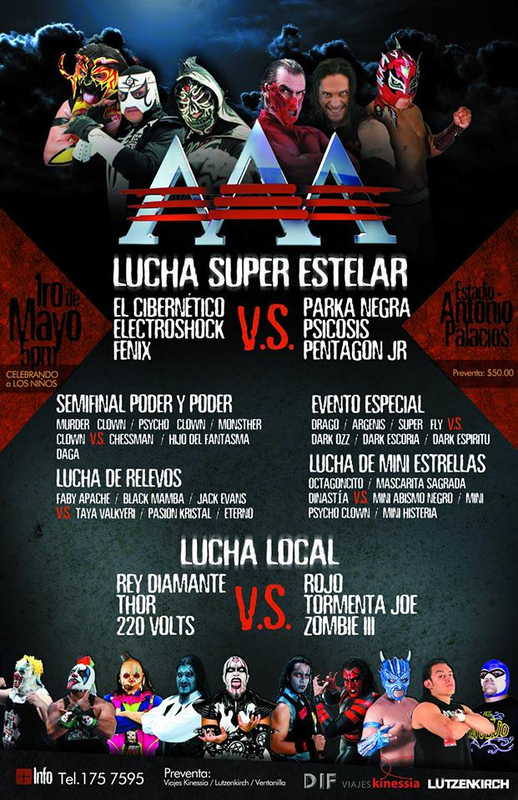 Memo and Galactar were added to a match for a new Silver Star championship. Romo got away with a foul on Panthro. 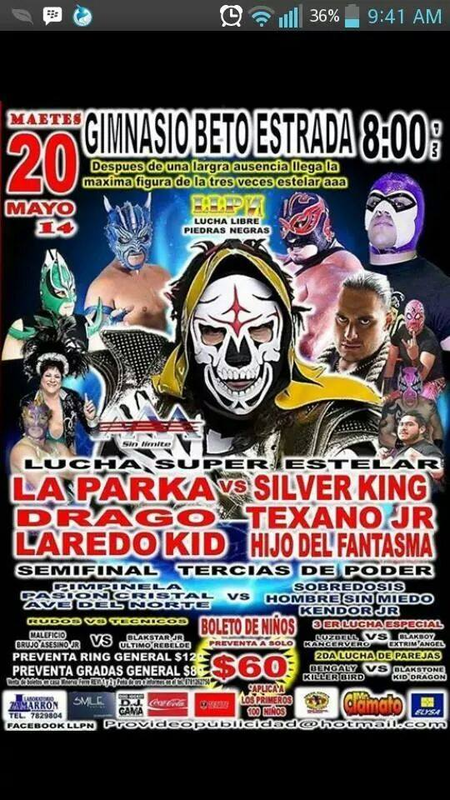 Tecnicos took 2/3, Parka sneaking a foul on Texano after Texano had done the same. 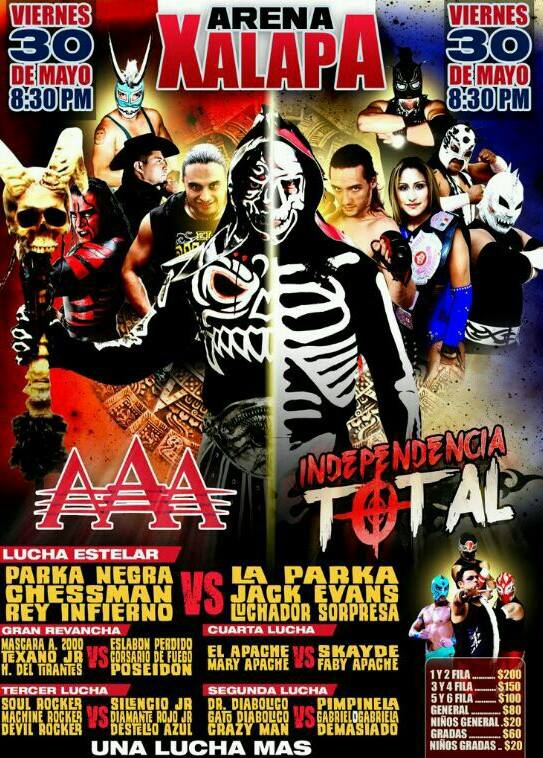 1) ?, Drago, La Parka vs Hijo del Fantasma, Silver King, Texano Jr.
2) Bella Karina, Perseus, Shun Lee vs La Hiedra, Pit Bull Jr., Rio Bravo Jr.
4) Argenis & Fénix vs Black Mamba & Pentagón Jr.
1) Darko, La Parka, Laredo Kid vs Hijo del Fantasma, Silver King, Texano Jr.
Mamba beat Mascarita Sagrada with a powerbomb. Listed originally as Daga defending the title, but Daga did not appear for reasons not yet explained - he may have been stripped of the title. 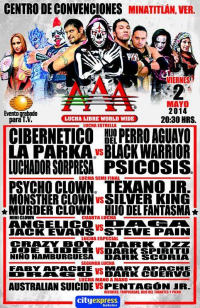 Psicosis replaced him, while Ricky Marvin replaced Bengala. 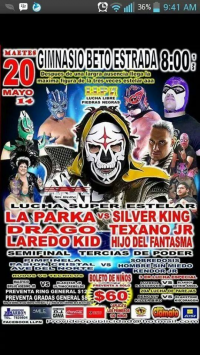 Aerostar beat Steve Pain for the win (may have been one pin to a finish) and was said to be the first finalist in a some sort of tournament for a title match. Billed as a title match, but apparently was non-title after all. Fantasma beat Monster Clown won and Texano celebrated with Psycho's mask after the match. 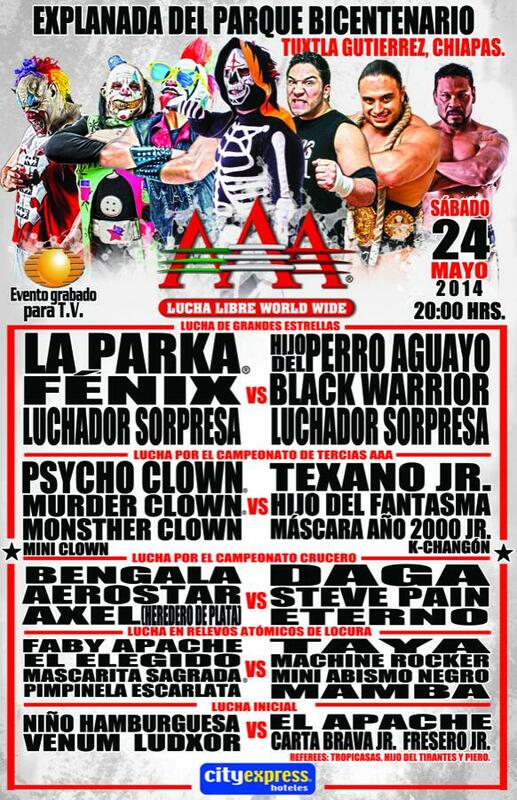 Averno was the mystery rudo, with Bengala as the mystery tecnico. Averno beat Bengala with the Devil's Wings for the win, but the lights went out and Mystery Man In White faced off with him to end the show. The Mystery Man appeared in a Mistico mask, then took it off to reveal an all white mask with gold eye covering. 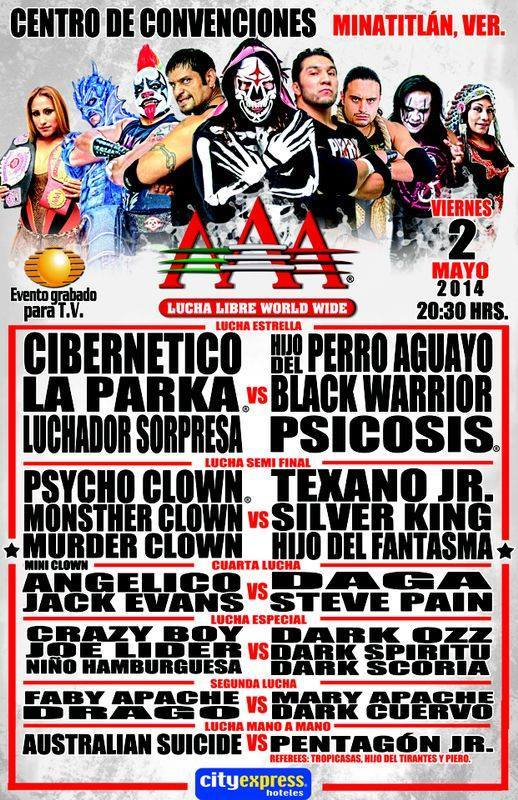 1) La Parka & Psycho Clown vs Hijo del Fantasma & Texano Jr. 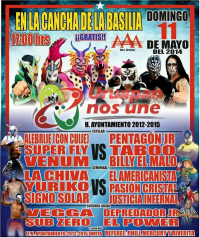 Sin Cara la Mistica on Averno. 3) Demon Rocker, Machine Rocker, Soul Rocker vs Destello Azul, Diamante Rojo Jr., Silencio Jr.
5) Monsther Clown, Murder Clown, Psycho Clown vs Mamba, Mr. Maldito, Texano Jr.